BetterHelp Online Counseling & Therapy. With the 256-bit SSL encryption and HIPAA Privacy regulations, you can be confident that your personal information will be well-secured 24/7. Therapists don't reply to messages on weekend. BetterHelp is definitely the safe place to share your personal thoughts and feelings. If you are looking for a client-oriented therapy that is free from stigma and judgment, this platform is the best choice. All conversations between a client and a therapist are saved in a chatroom, so if you decide to switch between counselors, you won't have to repeat your story again. Therapist's evaluation surveys might seem annoying. If you often travel but don't want to stop your therapy, using the TalkSpace system is the best choice. With this platform, you will benefit from the total mobility and top professionalism of its therapists. 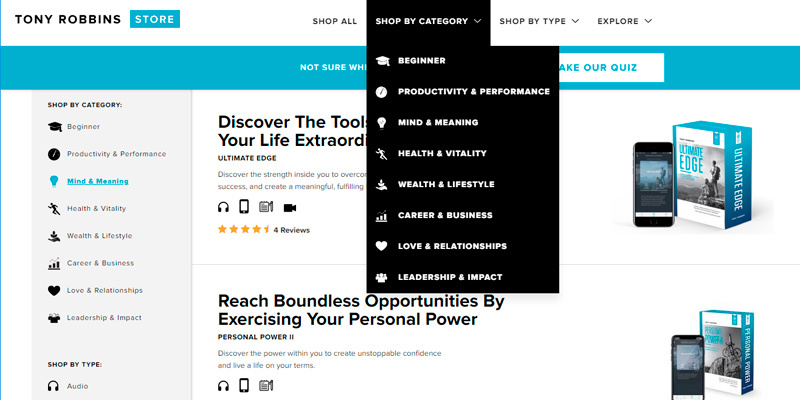 There is quite a wide range of articles and video materials in Tony Robbins' blog, so you can learn about his strategies and core ideas before starting this program. It is not a traditional therapy. Would you like to get inspired by the #1 coach and learn self-management as well as the basics of entrepreneurship? If yes, with Tony Robbins you have the chance to become a leader and change your life greatly. There is no need to update your chatroom all the time, since once your message is replied, you get a notification on your email. It doesn't support 3-way video sessions. Want to solve your couple arguments in a safe manner and give your relationships a second chance? ReGain is a solution. It boasts highly qualified staff, a user-friendly interface, and reasonable pricing for couple counseling. In addition to online therapy, every client of this platform gets access to Yoga and Meditation programs so that you could calm your mind and improve the progress. The Onlne-Therapy.com helps its users maintain mental and physical health through regular consultations, exercises for self-growth, and Yoga. 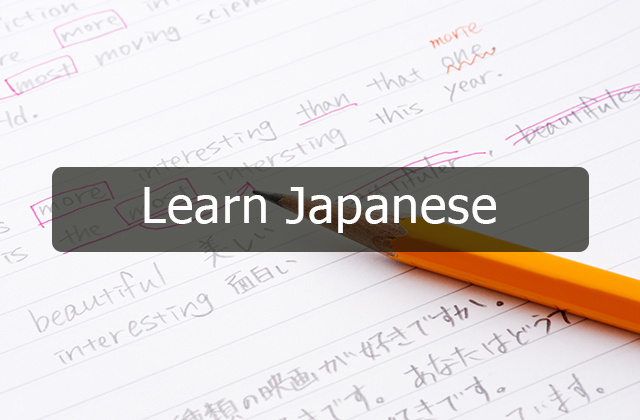 It also lets you examine your progress with the free tests and be aware of your results. BetterHelp is an online therapy provider with quite a large team of professionals. It employs almost 2,000 trained, experienced, licensed and accredited psychologists, social workers, family therapists, and each of them has a Masters or Doctorate degree in their field. Being a worldwide company, BetterHelp provides 24/7 support to anyone with a stable Internet connection irrespective of their location and time zone. You can contact your counselor in a live chat, sending a text message or initiating a video/phone session. Video and phone calls should be booked in advance, but you can leave text messages in your chatroom anytime. This might seem inconvenient at first, but actually, this only proves that there is a real person on the other end of the line. 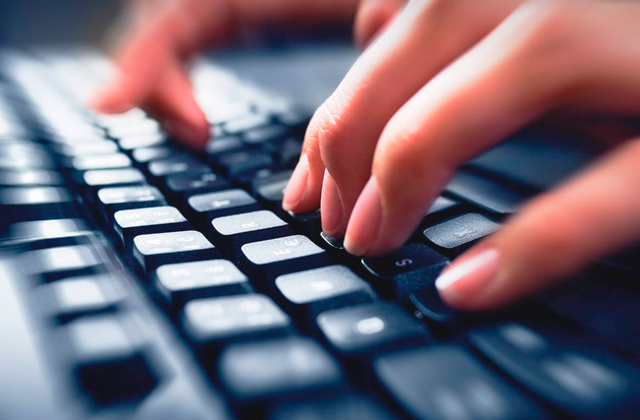 Plus, it has been proved that writing about your problem has a more significant therapeutic effect. So whenever you feel anxious or depressed, you can write about it to your provider or in your therapy journal to discuss it later. As for the area of competence, counselors in BetterHelp aid their clients with most of the on- and off-psychological problems such as anxiety, stress, depression, grief, trauma, parenting and relationship issues, and many more. 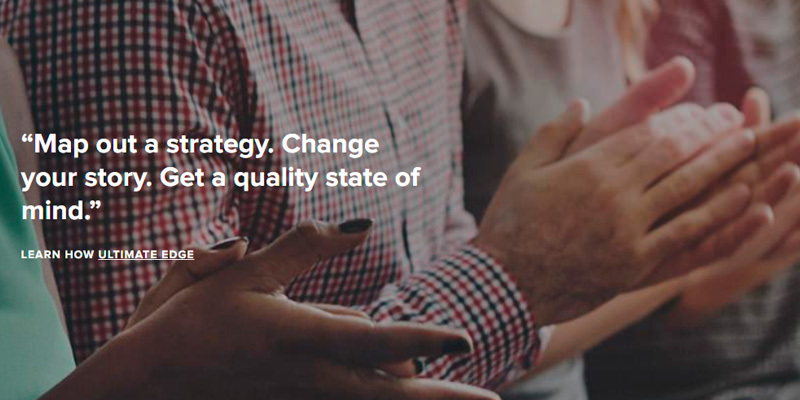 The BetterHelp is the platform that you can entrust your secrets. All your personal information is highly secured, with the exception of situations when your therapist finds out that your life is in danger. In this case, regardless of the provider or the type of therapy, a counselor must inform the proper service in order to help you. 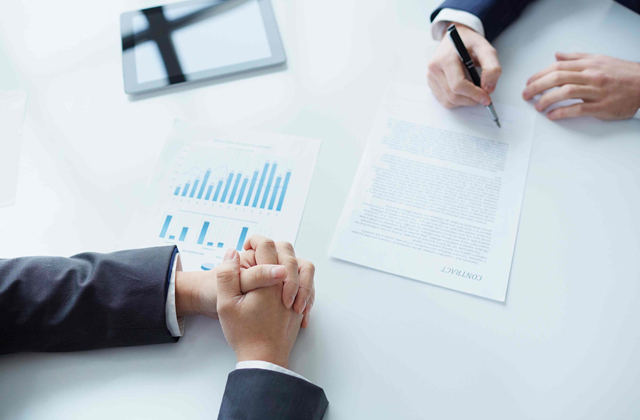 As for the protection of personal information, video/audio recordings, and text messages, the company takes several steps to guarantee privacy to their every client. You don’t have to identify yourself. You can use your alias for registration and stay totally anonymous. This platform follows the set of HIPAA regulations (federal guidelines which guarantee that all the health information stays between a client and their doctor). Every message you send or get from your provider is encrypted by banking-grade 256-bit SSL. This is the highest level of data protection, by the way. If you feel uncertain about saving your messages in the base, you can click the “Shred” button and all your messages will be deleted from the history. Positively, one of the best things about online anonymous therapy services is that you don’t have to spend long days to find a counselor, book an appointment, get to his/her office, and so on and so forth. 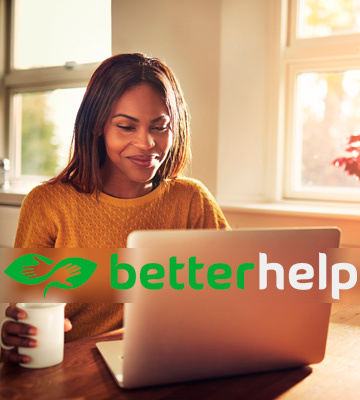 Here, you just need to take your gadget (tablet, computer, or smartphone) and register on the BetterHelp website. In general, it doesn’t take longer than 20 minutes. You will just need to answer a few questions about yourself and your situation, type your name, create a password, and you are ready to go. Then, you will need to wait until you are paired with a counselor. In practice, your match will be found within 24 hours. If after several online therapy sessions you realize that you and your therapist don’t click with each other, you can request for a new counselor. You will just need to give a feedback by telling the customer support service if you had any issues. 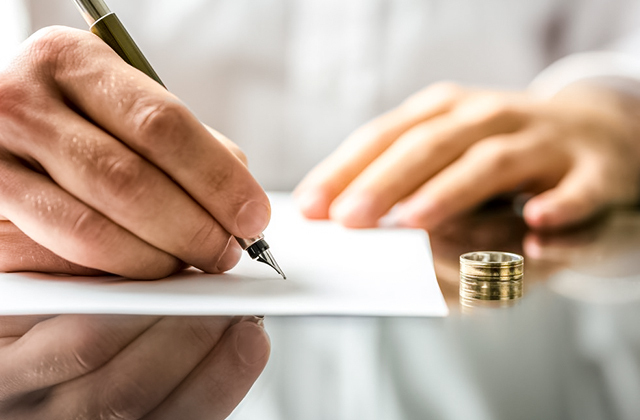 A provider will take this information into consideration while looking for a new match for you. Indeed, BetterHelp cares about their clients offering the highest level of security, professionalism, and a fair price. Would you like to find a safe place to share your personal thoughts and emotions? A place that is free from stigma and judgment, where you can be understood and accepted with all your virtues and flaws? Many will say that this place is in the office of their therapists, and they will be absolutely right. But not every therapist will offer constant support five days a week, and for a very reasonable price. Which is why if you think you'll need access to a counselor that frequently, we'd recommend you subscribe to TalkSpace. The company's weekly free is just about $50, and their subscription enables you to email or send voice messages to your counselor 24/7. You can also arrange a video call, but this will cost a bit more. Still, not as much as a face-to-face session in a therapist’s office. Apart from an attractive price, those of us who often travel will benefit from mobile therapy sessions. That is to say, it doesn’t matter where you are, you can still talk with your counselor until you have your smartphone, tablet, or PC and a stable Internet connection at hand. You may not get the response immediately, but you will definitely get it during a few hours. Unfortunately, your therapist will most likely be out of reach on weekends, which may be frustrating sometimes. On the other hand, you can write to your counselor when you need it and get a response the first thing on Monday morning. The workforce of the TalkSpace counts 2000+ licensed therapists with at least 3,000 hours of working experience each. They all have a license in a specific field and are eager to help their clients with different problems that may concern relationship, parenting, or more complex issues such as anxiety, depression, grief, PTSD. 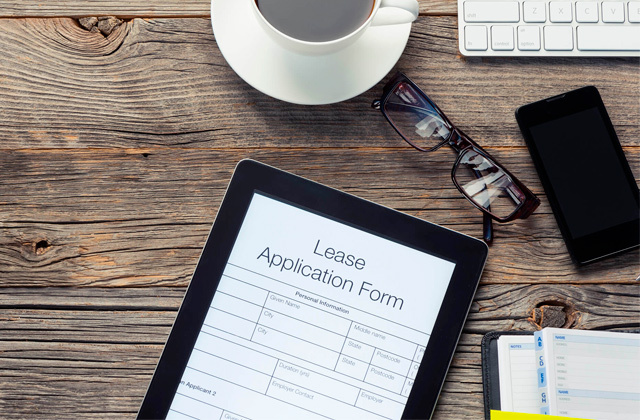 Luckily, you won’t have to search for a counselor among 2,000 candidates on your own. You will only need to register and come through a few simple steps. 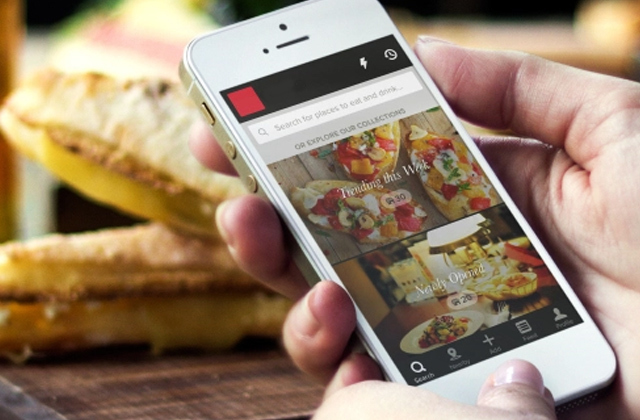 The platform will automatically find 3 best candidates that will match your request best. So, once you get started, you will meet a matching therapist who will ask you some general questions about yourself and your therapeutic goals. Or you can go a different route: choose a therapy plan that suits your goals best and wait until the service pairs you with the perfect match. That is to say, you don't have any obligations and if you feel like you don't match, you can always ask for someone else. At the same time, every counselor encourages their clients to give a feedback and tell them whether their expectations are met or not so that they could correct the therapy program for the best results. This is particularly essential at the beginning of the therapy during the adaptation period. So it is better not jump to conclusions for at least the first couple of online therapy sessions. By the way, if you do decide to switch a counselor, you won’t have to repeat everything you have talked about with the previous one, since all the conversations are saved in a chatroom. Handy, right? All the personal information, text messages, and videos are encrypted so that no one could have access to them. If you turn to another therapist, he or she won’t have admissions until you give it to them. Not only does such an opportunity to stay anonymous demonstrate how highly the company values the comfort and tranquility of each and every client, but also it allows reducing the stress related to social anxiety. Yes, this is not an online therapy service, this is an individual course of self-growth and development from Tony Robbins. Why did it get to our review of online therapy courses? Well, it’s pretty simple. Tony Robbins is the #1 life and business strategist who has gained lots of experience and success over 40 years of coaching in leadership psychology and helping millions of people find their way to happier and more successful lives. 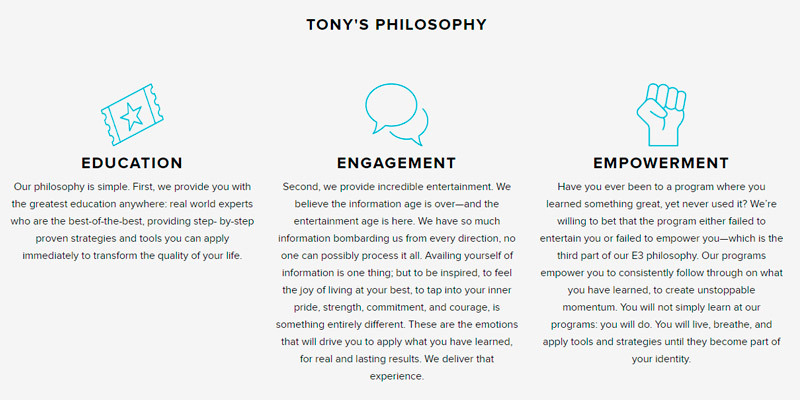 So what exactly does Tony Robbins offer? First off, the website has a wide selection of articles and videos on various topics. You will find a lot of useful information about leadership, relationship, business, wealth, lifestyle, and many more. You have a wonderful opportunity to learn more about Tony Robbins' core principles and decide whether they match up to your life philosophy or not. Then you can sign up for one of the events that Tony regularly organizes on every topic throughout the world. 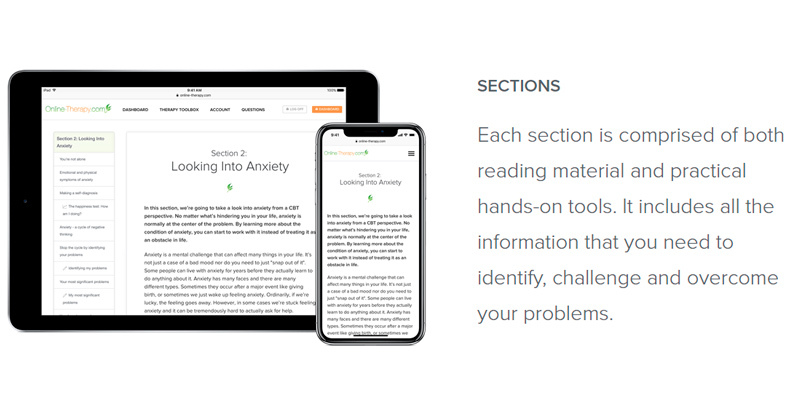 And finally, you can purchase one of his training systems that include audio/video materials, books, as well as a workbook/journal with steps, strategies, and useful ideas about your progress. 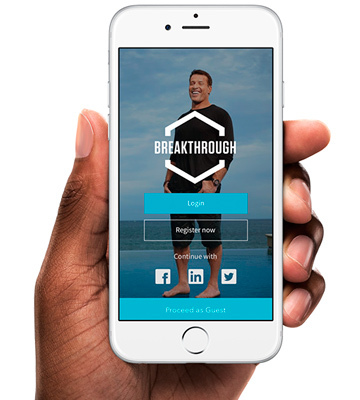 And of course, you’ll get the access to the Tony Robbins’ breakthrough app that will always be at hand even if your books are away. One of the main ideas of Tony Robbins’ philosophy is that our thoughts and beliefs control our lives. They determine our actions and decisions, and as a result, they have a huge impact on our wellbeing and personal progress. Negative, destructive thoughts can hardly make anyone happy, right? So, in order to succeed, we need to change our focus. That sounds pretty obvious, but it’s easier said than done. So what does T. Robbins suggest you could do? Find your own principles, things that motivate you most. After you determine your driving force, it will be easier for you to redefine them and change your life focus for good. Examine your convictions about relationships and change them. Our attitude to love and relationships affects our lives greatly. So if you believe that interaction with others is positive and full of love and joy, it will reflect in your bonds respectively. Create your new rules to live a happier life. Once you change your negative beliefs, it’s time to make a plan to achieve new goals and start putting it into life since it is completely within your power to make it happen. Well, most of us (if not everyone) who have evaluated coaching as a powerful tool for self-development and growth have reasonable doubts about its efficacy, especially after reading the failure stories. But, the thing is that no matter how we’d want it, there is no training programme that will make us successful and happy overnight. All the seminars, training programs, and even therapy sessions are simply useful additions for reaching your goals more effectively and safely. Their main purpose is to give you information and inspiration to proceed. After all, having a strong desire to change life and wise guidance from the person who has gone through the same situation is the halfway to success. And as Tony Robbins says: “There is no such thing as failure, there are only results”. Having warm relationships with others, especially with our spouse and children, is one of the most important things in our lives. Indeed, one can hardly stay peaceful and calm going through a divorce or domestic violence. But these are not the only situations when the help of specialist might be needed. 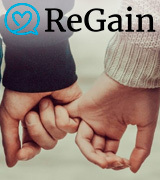 Qualified ReGain therapists help their clients not only cope with these difficult situations but also resolve parenting issues, overcome infidelity, intimacy, singleness, etc. This is a fairly new online therapy service yet it’s proved to be a reliable platform that you can entrust your personal thoughts and feelings. 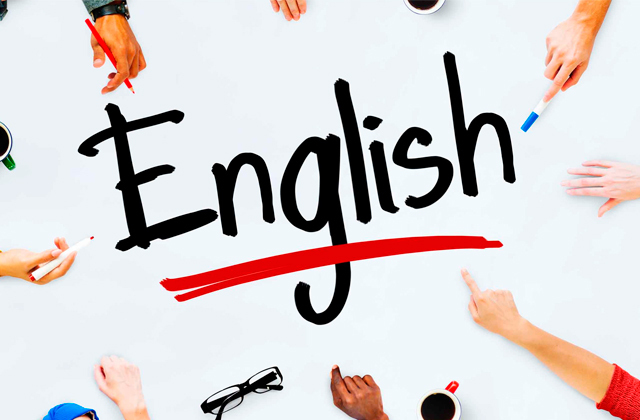 Every counselor who works in ReGain is a licensed specialist with Masters or Doctoral degree and years of experience. And while online relationship counseling may be new to you compared to face-to-face therapy, you can be sure to receive as a high level of proficiency here as you'd do at in-office meetings. If you are new to online couple counseling, you may wonder or even be a bit confused about the process. 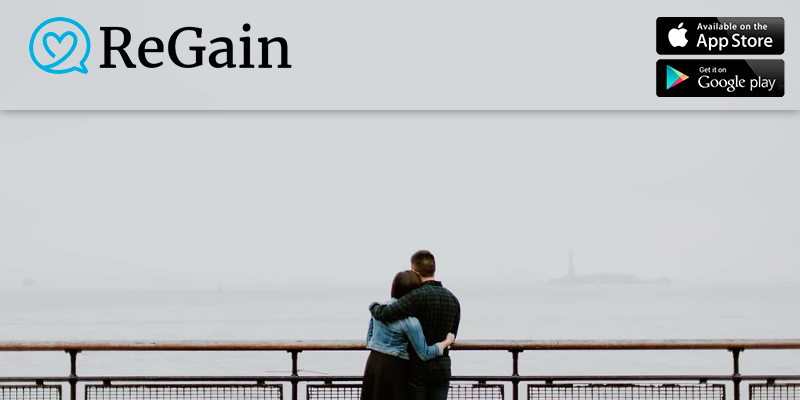 Online couple counseling means that there are three of you (you, your partner, and a counselor), and you communicate through text messages or leave voicemails in a chat room. Despite how awkward this might seem at first, in practice, though, it works wonders. Moreover, such an approach allows for faster progress when anxiety is a concern because distant communication has the potential to boost the level of comfort and sense of security. So how does it work? 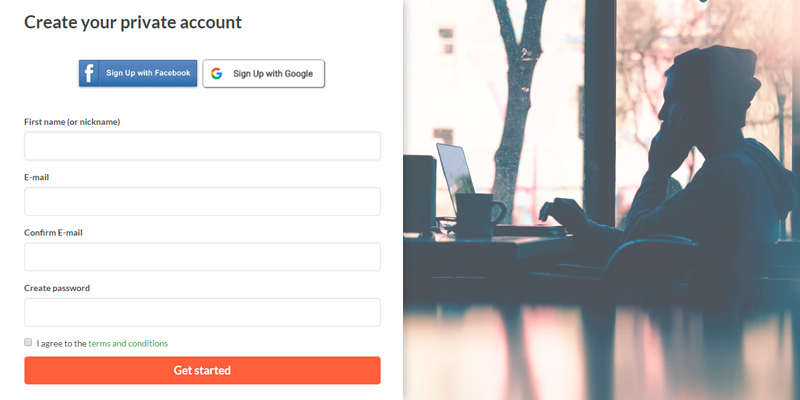 After creating your private account, which is very simple to do, all you need is to answer a few questions regarding your expectations of the therapy, then enter your name or alias, fill email address, and make a password. 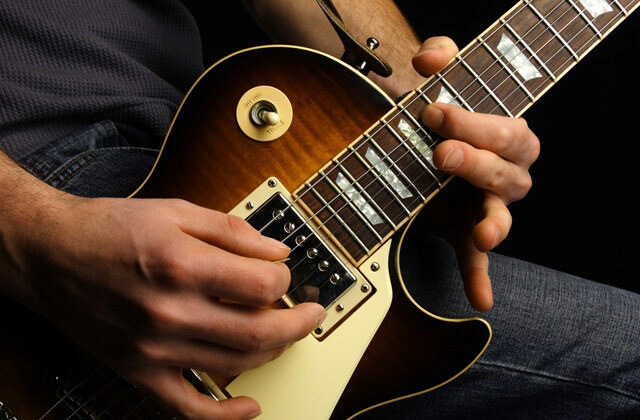 At this step, you can invite your partner or try an individual approach. It's worth mentioning that if you decide to invite your partner to the chat room later, he or she will get full access to all previous messages between you and your therapist unless, of course, you delete them. You can do so by clicking the “Shred” button within your secured 256-bit SSL encrypted chat room. 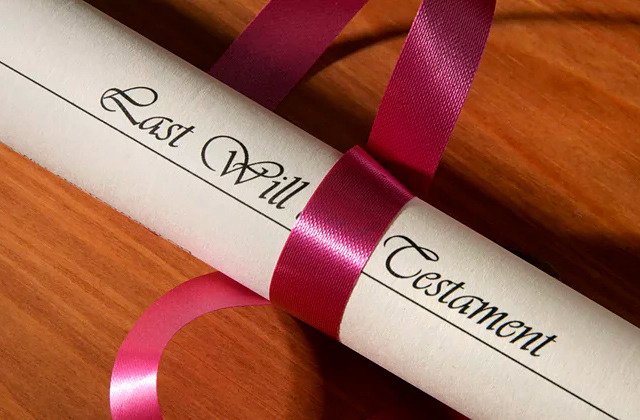 In addition to this method of data safety, the service is hosted in an “A Grade” facility which guarantees the maximal level protection of your personal information by state and federal laws. Indeed, when it comes to security, ReGain is at the top in the industry. Well, using this service is as simple as registering in it. 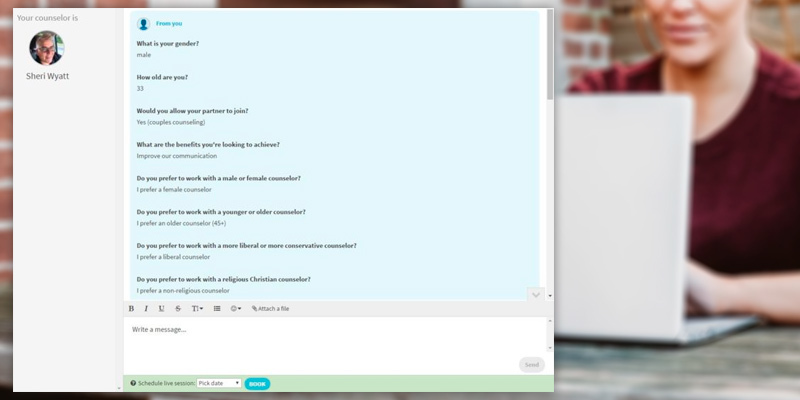 The chat room has a very intuitive interface and is implemented in calm colors that also add to stress reduction. Another useful thing is that you can use ReGain on-the-go without having to stay online and updating the page every 30 minutes to see whether you've got a response. You can simply synchronize your desktop version with your smartphone or tablet, regardless of the OS it uses. Besides, when your counselor or your partner replies to your message, you will instantly get a notification on your email. Handy, right? 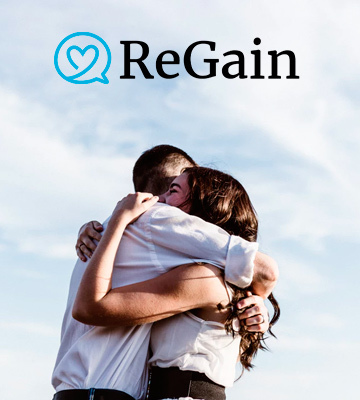 Without a doubt, with ReGain you get a safe place to share your personal issues, receive professional treatment, and access to a bunch of useful articles related to relationship problems, all at a very lovely price - from $35 per week. 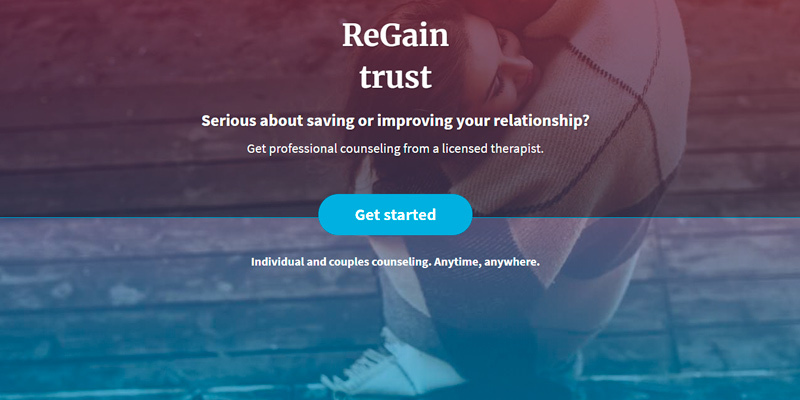 So if this sounds like the online therapy you have been looking for, then ReGain should be right up your alley. 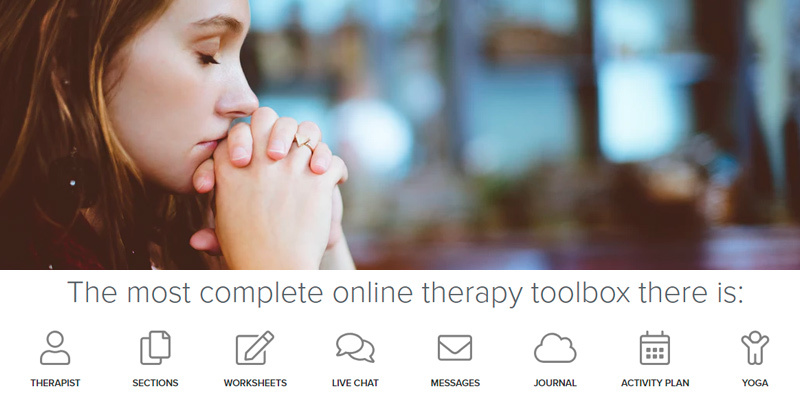 Online-Therapy.com is the platform that offers a user professional counseling and programs based on CBT (Cognitive Behavior Therapy). All counselors who work through this platform are trained specialists with at least 2,000 hours of hands-on experience. They help their clients overcome or relieve many psychological issues such as anger, anxiety, depression, addiction, agoraphobia, anger, insomnia, social and speech anxiety, stress, weight issues, etc. 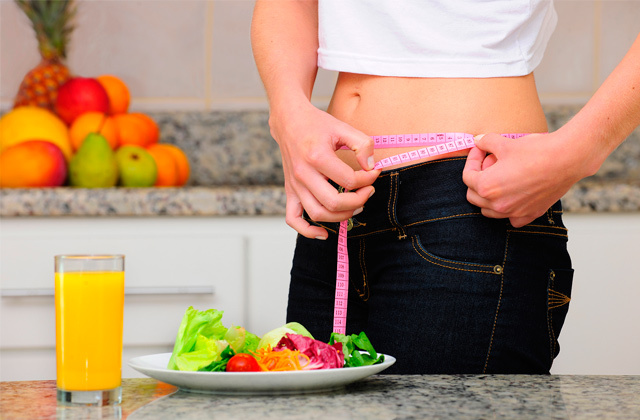 The treatment based on CBT is a proven method that gives as good results as face-to-face treatment. Cognitive therapy is based on the idea that our thoughts determine our behavior and feelings but not the people or events in our lives. And since our behavioral and emotional reactions can be learned, as well as our psychological patterns can be redefined, the main goal of the CBT is to help you switch negative focus to positive reactions. 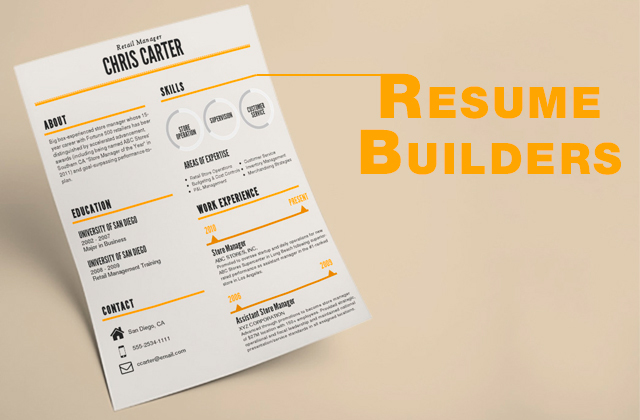 In order to boost your results, the provider offers you a comprehensive toolbox that includes a journal and a workbook where you can write your thoughts, feelings, and progress. And your paired counselor will give you a regular feedback on your notes. The last but not the least, you can totally benefit from Yoga and Meditation videos that will help you reduce stress and anxiety, boost happiness and positive thinking. Every Online-Therapy.com user gets an individual 8-step program that consists of 8 sections. Each section looks like a chapter in a book with detailed information of what you could do to transform your negative thinking patterns and achieve your goals. Every section has worksheets that are addressed to the questions related to the step you are going through. You need to answer those questions, do some tasks, and write how you evaluate this specific step and what is your progress within it. Your therapist will give you feedback within 24 hours (except weekend). Basic package: $39.95 per week ($31.96 on discount). You get full access to the 8-step program, Monday-Friday contact with a paired counselor, 25 worksheets, and hands-on tools. Standard: $59.95 per week (or $47.96). 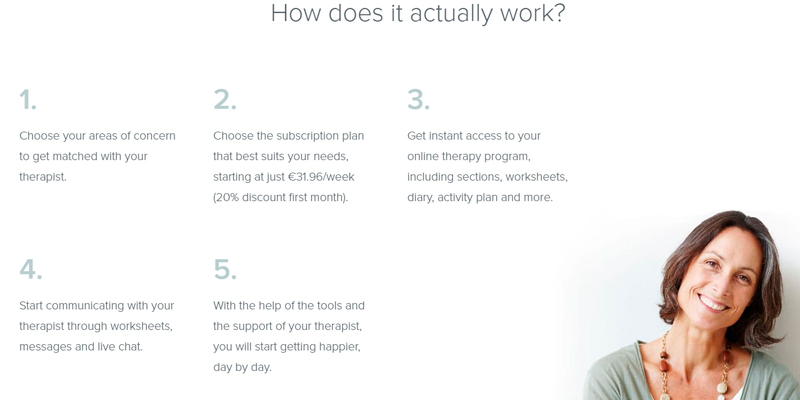 With this package, in comparison to the basic one, you get one additional live chat with your therapist and some extra support through text messages. Premium: $79.95 or $63.96 per week. 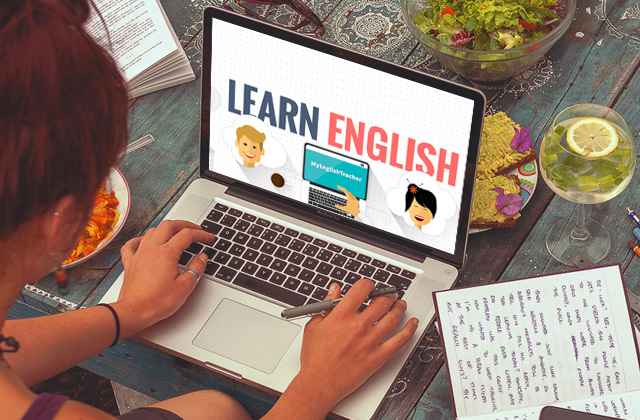 It differs from the previous packages with the express replies from a counselor and two live chat sessions. Moreover, if you decide that this service doesn’t work for you, the company offers a partial refund for the first 14 days of your therapy. However, you'll need to register for a free trial, have two or more live chats with your counselor, and reply to your therapist’s worksheets feedback. 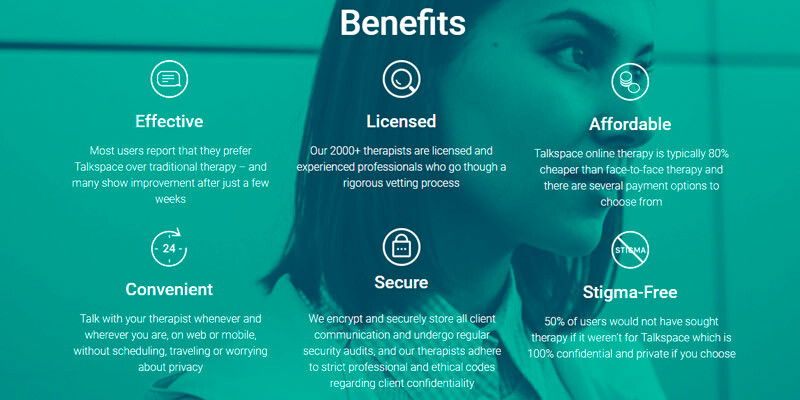 All in all, if you are searching for the highly secured therapy platform with qualify personnel and proved efficiency, the Online-Therapy.com is an inspired choice. You'll get the best assistance possible. 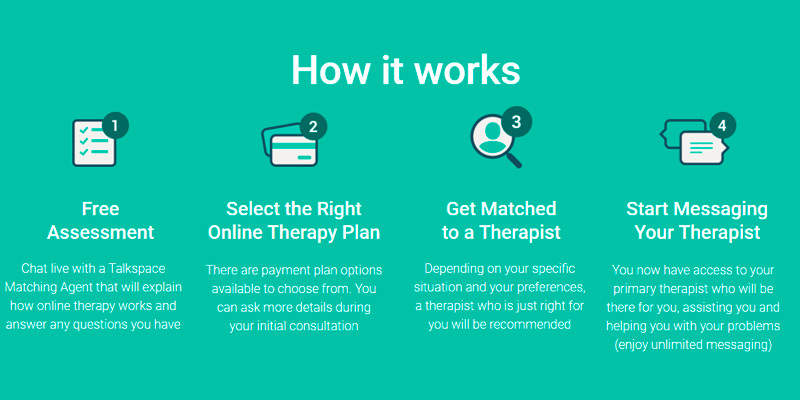 What Is an Online Therapy Service? Online counseling or e-therapy has become very popular over the last 20 years. It is a very convenient and safe way to share and cope with your personal problems. There are many online therapy sites today. They offer professional help from licensed therapists, organize self-help groups, provide couple and individual counseling. The choice is vast as well as the benefits this kind of therapy offers. Just imagine, you can wrap in your favorite blanket and share your feelings in a safe and comfortable way. All you need is your laptop, tablet, or smartphone, and a reliable internet connection. Many e-therapy users say that a distant counseling is particularly helpful when they feel uncomfortable or anxious sharing with a therapist face-to-face. Online counseling also allows people to save some money since the price is much lower compared to in-office therapy. At the same time, it's worth mentioning that this way of treatment might not always work for each of us equally well. For patients who suffer from a severe mental disorder, face-to-face therapy and medical treatment are likely to give better results. It hires only qualified licensed therapists with at least 2,000 hours of on-hands experience and Masters or Doctoral degree in their field. A professional company doesn’t offer some services. For instance, counselors can’t make diagnoses or prescribe medications. A platform is well-secured. All the private information is encrypted and a company follows the HIPAA privacy regulations. 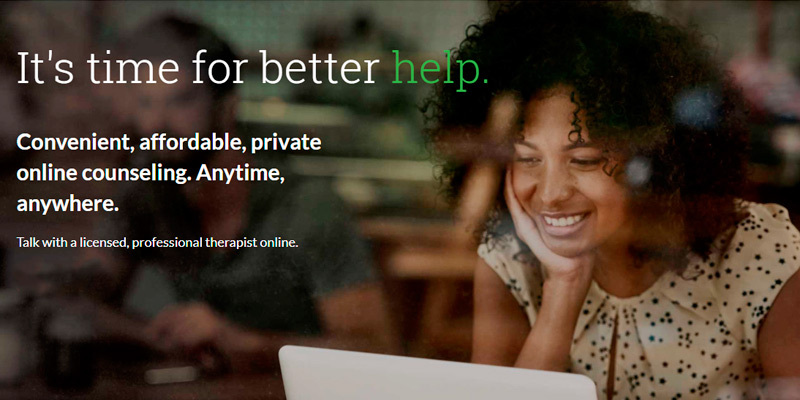 As a rule, online therapy services can help their clients cope with anxiety, depression, addictions, eating disorders, PTSD (Post Traumatic Stress Disorder), relationship, and LGBT issues. As for such issues as suicidal ideation or life-threatening situations, all professional online therapy sites have the list of emergency resources that one can turn to.